The following boundaries are designated as dividing lines for tidal and nontidal waters. These boundary lines identify whether a nontidal fishing license or Chesapeake Bay and Coastal Sport Fishing license is required. 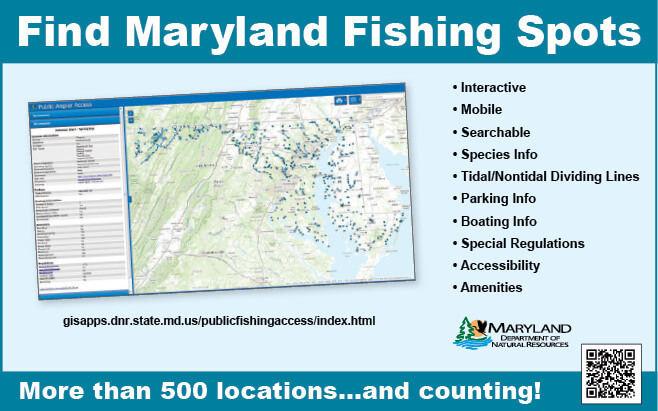 If you are fishing upstream of the location listed, nontidal fishing regulations apply. If you are fishing downstream of the location listed, tidal regulations apply. Northeast Branch Bridge at northbound lane of Alternate Route 1 Bladensburg Road. Northwest Branch Bridge at southbound lane of Rhode Island Avenue. Mainstem: bridge on MD Route 214. Lyons Creek: MD Route 4. Stocketts Run: confluence with the river. Rock Run: confluence with the river. Ferry Branch: confluence with the river. Severn River—bridge on MD Route 3. Bacon Ridge Branch: Chesterfield Road. Beards Creek: MD Route 214. Broad Creek: Harry S. Truman Parkway. Big Gunpowder Falls—three-fourths of a mile south of MD Route 7, the Old Philadelphia Road at the B&O Railroad Bridge. Little Gunpowder Falls—three-fourths of a mile south of MD Route 7, the Old Philadelphia Road at the B&O Railroad Bridge. Stansbury Park Pond—base of dam. Stemmers Run—Golden Ring Road Bridge. Patapsco River—B&O viaduct at Relay. Battle Creek—bridge about two miles east of Bowens (Sixes Road). Fishing Creek—one and one-half miles upstream from the mouth of the creek at Chesapeake Beach. Hall’s Creek—bridge on MD Route 4. Hellen Creek—Mill Branch Road, near Solomons. Hunting Creek—bridge on MD Route 263 about 100 yards west of MD Route 4. Island Creek—Ross Road, near Brooms Island. Lyon’s Creek—bridge on MD Route 4. Plum Point Creek—bridge on MD Route 263. St. Johns Creek—MD Route 4. Chapel Branch—MD Route 313 near Piney Grove Church. Choptank River—bypass on MD Route 313 on the outskirts of Greensboro. Fowling Creek—wooden bridge on Stratum Road about one mile below MD Route 16. Marshyhope Creek—at its confluence with Faulkner Branch. Tuckahoe Creek—abandoned stone railroad bridge upstream of MD Route 404. Watt’s Creek—bridge on American Legion Road. Big Elk Creek—MD Route 213. Happy Valley Branch—confluence with Susquehanna River. Little Elk Creek—US Route 40. Mill Creek—Old Elk Neck Road. North East River—MD Route 7. Octoraro Creek—bridge on US Route 222. Principio Creek—Amtrak crossing below MD Route 7. Rock Run—confluence with the Susquehanna River. Henson Run—bridge on Old Broad Creek Road. Mattawoman Creek—bridge on MD Route 225. Mill Run (Burgess Creek): MD Route 6. Hill Top Fork: MD Route 6. Wards Run: MD Route 6. Oxon Creek (Run)—MD Route 210. Swanson Creek: MD Route 381. Mataponi Creek: St. Thomas Church Road. Spice Creek: MD Route 382, Croom Road. Full Mill Branch: MD Route 382, Croom Road. Black Swamp Creek: MD Route 382, Croom Road. Piscataway Creek—bridge on MD Route 224 (Livingston Road). Port Tobacco Creek—bridge on MD Route 6. Potomac River—Little Falls at man-made dam. Western Branch—bridge on MD Route 4. Wicomico River—Allens Fresh, bridge on MD Route 234. Transquaking River—dam at Higgins Mill Pond. Bynum Run—Old Philadelphia Road Bridge on MD Route 7. Deer Creek—railroad bridge located at the mouth of Deer Creek. Gray’s Run—CSX Railroad crossing upstream of US Route 40. James Run—Old Philadelphia Road Bridge on MD Route 7. Winter’s Run—dam located one half mile south of MD Route 7, the Old Philadelphia Road. Chester River—500 yards upstream from the Pennsylvania Railroad Bridge at Millington at the point where the Cypress Branch empties into the Chester River. Red Lion Branch—at its confluence with the Chester River. Unicorn Branch—U.S. Geological Survey weir just east of MD Route 313. Wye East River—Wye Mills Lake dam. Chaptico Run—Chaptico Bridge on MD Route 234. Gilbert Swamp Run—MD Route 234. Great Mills Run—bridge on MD Route 5. Park Hall Run—MD Route 5. St. Clements Creek—MD Route 234 bridge at town of Clements. Town Run—bridge on MD Route 5. Conowingo Dam—at US Route 1. Beaverdam Creek—dam just upstream of US Route 13 (Business). Pocomoke River—bridge on Whiton Crossing, three miles south of Powellville. Wicomico River—Isabella Street in Salisbury.